...that Yayap is the only known Unggoy to have been respected by Kig-Yar? ...that Lockout is allegedly haunted by the Ghost of Lockout? The Pious Inquisitor, later renamed Naomi by Staffan Sentzke after his daughter, was a Covenant CCS-class battlecruiser reputed to be one of the fastest ships in the Covenant fleet. After the High Prophet of Regret discovered the location of a portal to Installation 00 in his search for relics, he quickly conjured the Fleet of Sacred Consecration and left for the Ark's location. Pious Inquisitor was a part of the fleet. He was unaware that the relic he sought after was located on humanity's homeworld, Earth. After exiting slipspace in the Sol system, the fleet was vastly outnumbered and attacked by the UNSC Home Fleet's Fifth Fleet, beginning the Battle of Earth. The Inquisitor remained intact through the Battle of Earth and it was under Jiralhanae control at the beginning of the Great Schism. During the Schism, the Sangheili under the command of Rtas 'Vadum took over the ship and took it to High Charity to join the Covenant separatists. The Inquisitor then aided the Fleet of Retribution in preventing the Flood from spreading. Now part of the fleet, it joined pursuit of a Flood-controlled ship that escaped to Earth. Back to Earth, the fleet helped to cleanse Voi and its environs of the parasite via glassing. Afterward, the Pious Inquisitor entered the Portal and took part in the Battle of Installation 00. Ultimately, the ship survived the battle. After the war, the Pious Inquisitor returned to Sanghelios. At some point, the ship was stolen by Avu Med 'Telcam, the Bishop and head of the Servants of the Abiding Truth. 'Telcam intended to use the Inquisitor to his advantage during the Sangheili civil war, against the forces loyal to Arbiter Thel 'Vadam. 'Telcam had entrusted the ship to a group of Kig-Yar, led by T'vaoan pirate Sav Fel. However, the Kig-Yar decided to sell the ship for themselves and Fel took the Inquisitor to a barren star system for safekeeping. Upon being informed of this, the ONI team Kilo-Five began working to take back the Inquisitor for study and reverse-engineering of its ventral beam by the Office of Naval Intelligence. Sav Fel fled to the human colony of Venezia and began negotiating with insurrectionist Staffan Sentzke, who originally planned to use the ship to glass Earth. As payment for the ship, Fel demanded particle beam rifles, dropships, and plasma pistols. Sentzke stated that he would first need to see the ship and test its ventral beam. Fel told him the ship was in another system and that he planned to show him something extra when he saw the ship. Sav Fel transported Staffan and his son, Edvin, to his ship in a shuttle and then took them to where he had hidden Pious Inquisitor. At Staffan's request, Fel agreed to demonstrate the battlecruiser's energy projector on a desolate world. When the ship arrived at its destination, Shaps III, the vessel's eccentric Huragok caretaker, Sometimes Sinks, told Sav Fel that he couldn't use the ship's energy projectors since there were Forerunner artifacts on the surface. Fel ignored the Huragok and began to glass the artifacts. Then, he let Staffan have a chance to do the same. Not wanting to upset the Huragok, Sentzke allowed Sinks to aim the beam elsewhere to avoid damaging any more ruins and then proceeded to glass a portion of the planet. Satisfied with the ship, Sentzke completed the deal with Fel, keeping Sinks as the ship's chief engineer. Meanwhile, 'Telcam had hired Kig-Yar Shipmistress Chol Von to steal back the Inquisitor from Fel. After Malcolm Geffen and Vasily Beloi of Kilo-Five infiltrated the Venezian militia, Sentzke quickly learned that the two supposed UNSC deserters had experience with operating Covenant technology and took them to see Pious Inquisitor. However, Sentzke and his son Edvin came to doubt the two Marines' cover story after an attempt by an unknown party to seize control of Pious Inquisitor using Venezia's FTL communications relay. Shipmistress Von and her crew captured Sav Fel, who led them to the location of Pious Inquisitor. Von's Kig-Yar boarded the ship, but Sometimes Sinks continued to hinder their attempts to access its vital systems and made a slipspace transition to a different location, uncoupling Inquisitor from the Kig-Yar ship and killing several of the pirates. Shortly afterward, Kilo-Five was able to locate Pious Inquisitor. Sometimes Sinks had placed the ship in lockdown and only followed Sentzke's orders, forcing Kilo-Five to take the captured Staffan along as they entered the battlecruiser. With the rest of Kilo-Five advancing toward the bridge, Chol Von set the ship's plasma torpedoes to detonate, which would cause the Inquisitor to violently self-destruct. While Kilo-Five evacuated to their own dropships, Sentzke took a Spirit from the shuttle bay, intending to use the Covenant dropship to escape. Von and her remaining crew then made their way for a shuttle bay in order to escape. Kilo-Five watched the ship explode from a safe distance, while Staffan and Sinks escaped in the Spirit, unbeknownst to the others. 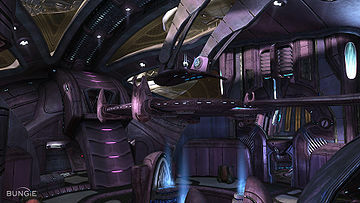 Pious Inquisitor is the setting for the Halo 2 multiplayer map Midship. The ship is also the location of the Halo 3 multiplayer map Heretic, a remake of Midship. According to bonus features in the Halo 2 Collector's Edition, Begotten Angel was the original name of the vessel featured in Midship. Inquisitor preparing to leave for Earth with its fleet. Inquisitor and the Fleet of Retribution exiting slipspace over Installation 00. ↑ Halo 2: Anniversary, Terminal 14: "Beholden"